After checking in to my hostel, I went to a nearby cafe/restaurant to have lunch. I heard that that the Pork Knuckle in Budapest is very good so I had to try. The hostel staff recommend this particular cafe that was nearby and I probably had the best Pork Knuckle in my life! I have not been to Germany to try theirs yet, so this is way up on my list for now. Then I went to experience authentic Turkish Bath at Rudas Bath. A scene from the movie Red Heat, starring Arnold Schwarzenegger, was shot there. Rudas Bath is a thermal and medicinal bath built in 1550. That was almost 500 years ago! When I went in, they passed me a small piece of cloth, supposedly to cover my privates. But when I looked around, I realised that the small piece of cloth didn't make much of a difference. So I wore trunks, and that piece of cloth, of course. Sorry, no cameras allowed inside = no pictures. Have to use a little of your imagination! There are different therapy pools inside and each pool is of a different temperature. I went to each pool one by one and the pool that I had problem getting in was the coldest pool. It was icy cold! I had to force my myself to jump in and after a while, it was all good. Hey, I had to do it because I paid good money to enter and furthermore, it was supposed to be good for my body right? I can't believe I traveled all the way to Budapest to "bathe" with 30 other naked men. But I really felt good after the soaking in the bath. I felt kinda "lighter" if you know what I mean. Budapest is divided into 2 cities - Buda & Pest. (How convenient right?) Buda is the hilly West side of the Danube River and Pest is the flat East side of the Danube River. I was staying at the Pest side of Budapest and Rudas Bath is located at the Buda side of Budapest. 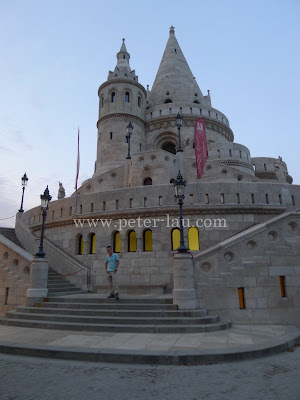 Went to Castle Hill, which is at Buda and quite near to Rudas Bath. Went back to hostel to rest for 1 night. Need to wake up early the next morning to catch a train to Vienna, Austria!!! After taking a "bath" with 30 naked men, MY LIFE WAS NEVER, EEEEEEEEEEEEEEEEEEE..........................EEEE........................................EEVER, THE SAME, AGAIN!! !